The CR-V continues to be a trusted name in the American crossover class. Mechanicstown drivers can find the 2013 Honda CR-V at Middletown Honda. We’re located near the intersection of Highways 17 and 211 in Middletown, next to Gander Mountain. Drivers love the CR-V in part because of its reliability, reputation for safety, and great features. In terms of value, the 2013 Hyundai Tuscon just doesn’t compare. Cargo volume. Space is an important factor in any crossover vehicle. The CR-V has a maximum cargo volume of 70.9 cubic feet, compared to the 55.8 cubic feet available in the Tucson. Towing power. The CR-V has a maximum towing capacity of 1,500 pounds, rivaling some larger vehicles, while still maintaining an average fuel economy of 23 mpg in the city and 31 mpg on the highway* in 2WD models. Despite having a comparable engine size, the Tuscon is only able to tow up to 1,000 pounds. Features. 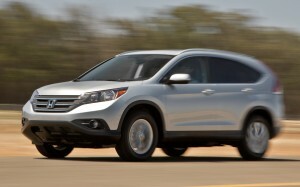 Several essential features come standard on the 2013 CR-V that are either unavailable or optional on the 2013 Tuscon. These include a power tailgate, a rearview camera, and a folding split 60/40 rear seat. Both vehicles received recognition from the Insurance Institute for Highway Safety as Top Safety Picks for 2013, but only the CR-V received a 5-star overall rating from National Highway Traffic Safety Administration safety tests. Standard safety systems on the CR-V include airbags throughout the cabin, stability control, traction control, and a tire pressure monitoring system. An electronic parking assist function also comes standard — a feature that’s only optional on the Hyundai Tuscon. If you’d be interested in learning more about what else the 2013 Honda CR-V has to offer, a member of our sales team would be happy to set you up with a test drive! We’ll help you to explore the options that may be best for you. Middletown Honda is located just 10 minutes northeast of most of Mechanicstown, so visit us today!